Paper, Pens & People is about creative and fresh ideas. It's not a creative rule book, but a suggestive guide of techniques and projects to make the creative process more fluid and more enjoyable for students. Often, it's our setting and mindset that determines creative output, so in order to be truly effective we need to set the scene, and that also includes within ourselves. At this initial stage of the process all we need are paper, pens and people - we keep it organic and focus on generating solutions without any interference. With the projects featured, there's a focus on seeking out solutions for our planet rather than profit and commercialism. These ideas are recorded in a simple sketch book. 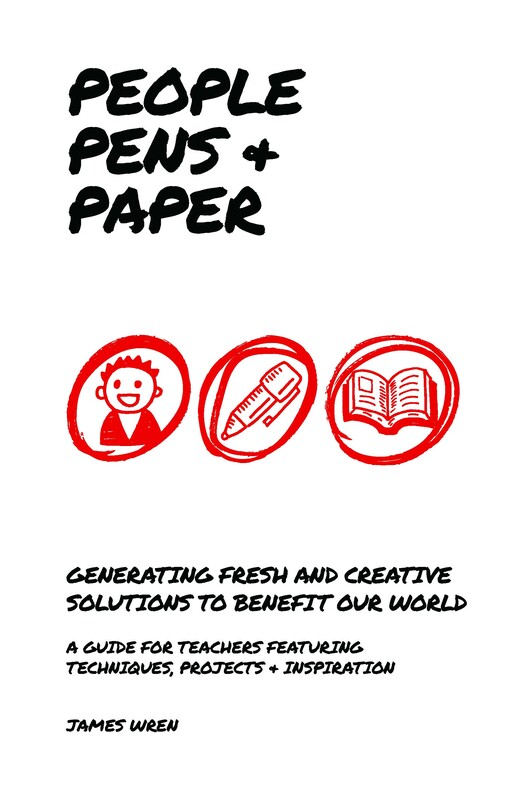 This book can then help form a 'portfolio' of concepts for each student, so not only do the ideas look to help our world, they also show initiative and entrepreneurial flair, useful for life beyond school. From a marketing campaign for a local charity through to looking at ways to solve traffic issues at a school, teachers will be able to use innovative projects to inspire and also foster habitual ways to conceptualise, be it written or doodled. Readers will find no rules or quick-fixes. Paper, Pens and People is all about the process.